I Tried Christmas Needlepoint Ornament:. 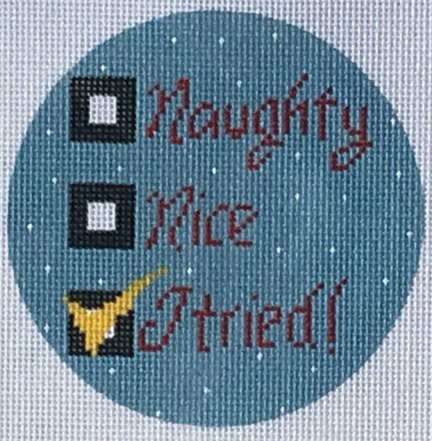 This needlepoint ornament by Danji Designs is perfect for the whimsical child and depicts a check list of Naughty, Nice or "I tried" . The I Tried Christmas ornament design is sold canvas-only or with fibers. You can make your selection from the drop-down menu on this page. if you select cotton we will send DMC embroidery floss; wool is Bella Lusso; the silk is Planet Earth Pepperpot silks.